Porches are a great place for relaxation. A place where you can be outdoors without being too far from home. So, it only stands to reason that we take a lot of time to make our porch look nice. There are many different porch styles that can fit your home. Here are some explanations of these different styles so that you can see what will work best for your home, courtesy of BobVila.com. It doesn’t get much more inviting than the old-fashioned farmhouse porch, with its expansive wrap-around layout and unpretentious style. Initially created to help cool the home’s interior and provide a comfortable respite at day’s end, these covered porches are practical, comfortable, and simple in their trim and design. Country-style porches generally open to the yard, and many are so low that you can safely step off the side to the ground. Raised designs typically feature wood railings and decorative lattice underneath. 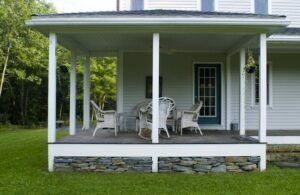 Screen porches are a nice farmhouse option, and these can sometimes be fashioned using salvagedscreen doors. Or opt for a semi-screened look by adding trellises and railing planters between porch posts. Finish out the space with stained or painted wood floors and ceilings personalized with paint or pressed tin. Choose furnishings for comfort and personal style. Wicker is a traditional favorite, but wood, cast iron, and repurposed found objects also work well. Finally, don’t forget the nostalgic finishing touches—a porch swing and a slamming screen door. America’s Colonial period brought a melting pot of home design ideas, which in turn produced Dutch Colonial, French Colonial, and other styles. Generally speaking, homes of this era were two stories and symmetrical. As settlers moved onward, however, the style was modified to suit the environment. For instance, in the steamy South, generously sized porches with bold, classical columns were added across the entire front of the house to help people beat the heat. The result? A coveted retreat for Southerners and the birth of one of America’s most beloved porch styles. Colonial porches keep to the architecture’s overall principles of symmetry, formality, and elegant restraint. Columns accomplish much of the visual design work, from massive two-story pillars to simpler paired columns stretching across the home’s facade. If used, wood or aluminum railings typically showcase tasteful Chippendale-style fretwork or herringbone patterns. A central door with fanlight and sidelights add balance. As for palette, crisp white, gray blues, and tans depict classic Colonial colors, as do ceilings that are brushed in haint blue. Furnishings should be gracious and plentiful, including rocking chairs, settees, planters and even lighting. Chandeliers sparkle on grand porches; period-appropriate lanterns and sconces enhance more modest and Early American houses. To ensure a pleasant breeze, you might also consider adding one or more ceiling fans overhead. Echoing Victorian-era tastes, Queen Anne architecture reflects a penchant for personal expressiveness and over-the-top decoration. Forget any notion that “less is more.” The ornate wraparound porches and recessed second-story retreats adorning the asymmetrical fronts of Queen Anne homes were designed to impress. Propitiously, advancements in woodworking machinery in the late 1800s made previously expensive ornate porch pieces suddenly affordable, meaning homeowners could now pile it on with eclectic abandon. Among the fanciful options: delicately turned posts with beveled corners and attached fretwork, railings with flat-sawn balusters, elaborate spindle work, finials, spandrels, corner brackets and friezes. (Victorian millwork is still readily available, but if you want to avoid the painting upkeep of these intricate patterns, consider porch pieces made of high-density urethane instead.) Other embellishments include walls covered with fish-scale shingles or patterned masonry and doors and windows of etched or stained glass, enhanced with generous decorative trim. Bold paint palettes further the busy look. Fortunately, all the fuss on a Queen Anne porch is put to good use, as the space is considered an important outdoor room for entertaining. Look for wrought iron and wicker pieces to seat guests with old-fashioned charm. Containers and colorful plantings add a nice finishing touch, too. A notable departure from the mass-produced elements and design excess of the Queen Anne style,Bungalow architecture grew out of California’s Arts and Crafts movement. These affordable cottages with low-pitched roofs feature expansive front porches that open to the yard and garden, expanding the home’s modest living space while also encouraging a strong connection with nature and the neighborhood. In general, Bungalow craftspersons utilize natural and handcrafted materials. The prominent oversize porch columns or pillars, for instance, are usually crafted from brick, wood, or stone (such as local river rock). Also common are battered, or tapered, posts atop a raised brick, stone, or wood pier. Concrete-capped brick knee walls or low, simple railings link the columns. Decorated as though an extension of the adjacent living room, Bungalow porches can be fairly rustic with earthtone palettes, twig or Mission-style furniture, and artisan lighting. Floors are typically wood, plain concrete, or concrete overlaid with ceramic tile, bluestone, fieldstone or brick. Exterior Specialties of PA is here to help with all of your deck building, deck installation and help you choose the best of these porch styles for your home. Call us today at 215-453-9180 for your FREE estimate!